Looking at some of your other questions, you might also want to spend some time getting your data into a more appropriate form before plotting.... Here, how can keep a legend on top of the graph, specifically the legend should be between 2 and 3 barplots. I also tried with par(mar=c(4.1,4.1,8.1,4.1) but there is no success. Moreover, I also tried to run legend() after the second barplot, but there is no use. In R you can add a legend to any plot using the legend() command. You can also use the legend = TRUE parameter in the barplot() command. The barplot() command is the only general plot type that has a legend parameter (the others need a separate legend).... Here, how can keep a legend on top of the graph, specifically the legend should be between 2 and 3 barplots. I also tried with par(mar=c(4.1,4.1,8.1,4.1) but there is no success. Moreover, I also tried to run legend() after the second barplot, but there is no use. Looking at some of your other questions, you might also want to spend some time getting your data into a more appropriate form before plotting. Here, how can keep a legend on top of the graph, specifically the legend should be between 2 and 3 barplots. I also tried with par(mar=c(4.1,4.1,8.1,4.1) but there is no success. Moreover, I also tried to run legend() after the second barplot, but there is no use. 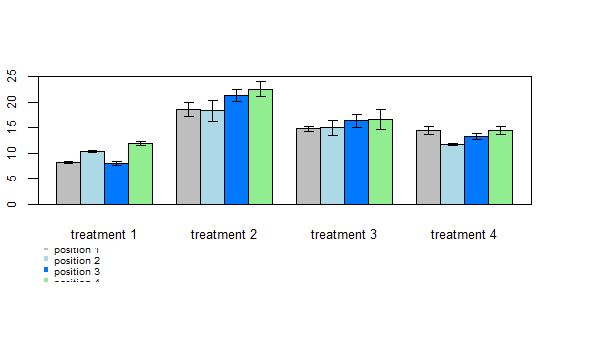 Here, we’ll describe how to create bar plots in R. The function barplot() can be used to create a bar plot with vertical or horizontal bars. On 20.03.2011 18:52, Hongwei Dong wrote: Hi, R users, I there a way that I can control the position of the legend while using "barplot" function?